Gratitude is something we can all practice daily. This time of year, the concept of being grateful rings especially loudly. 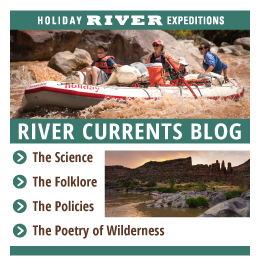 We can think of ten heartfelt reasons to be grateful for outdoor adventures like river rafting trips and mountain biking trips, and we want to share them with you. because it allows you to recharge, refresh, and soak in the quiet rhythms of the world. because they are deep, they are long, they are stunning, and they are still wild. because it makes for beautiful trails, exciting turns, thrilling drops, and awesomely fun singletrack. because it pulls us out of our urban lives and reminds us wildlife in the natural world is vibrantly alive, fascinating, and immense. because they’re lovely to behold, pleasant spots to set up camp, and make for excellent places to hold impromptu games of catch, tag, volleyball, and more. because the faint yet still clear marks of their passage remind us they were here, too, and they loved, giggled, cried, rejoiced, and played just as we do in these amazing wilderness landscapes. because wow, are they spectacular, and there are so many more than you ever thought you’d see at once. because we like to ride the waves, drift the flats, and swirl in the eddies; because we can’t get to where we’re heading without the river always running downstream. because it happens every single day, on every single trip, and adds to the joy of navigating those tricky rapids or descending that technical hill. because without you, we couldn’t be enjoying the amazing “work” we get to do!